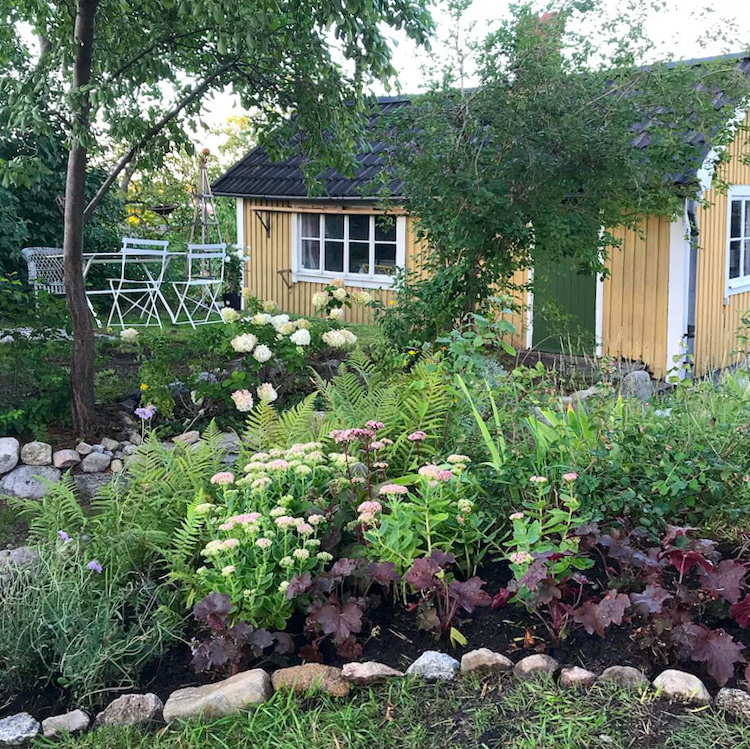 Malin Brostad loves gardening. In fact, she loves plants and flowers in general. 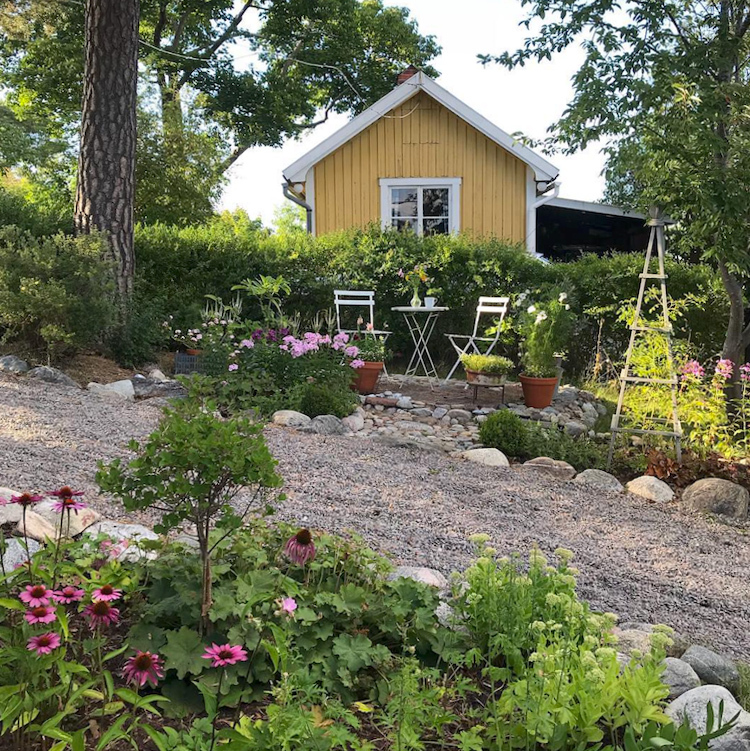 The borders in the garden of her pretty, classic yellow and white house in Hässelby, Western Stockholm are bursting with fox gloves, ferns, roses and other species hardy enough to withstand the Northern climate. 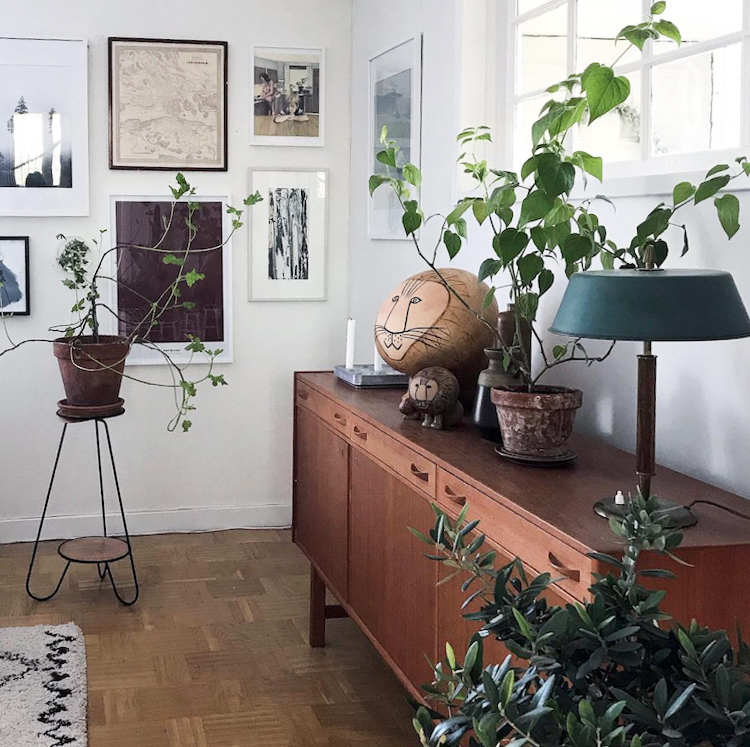 In the winter, more sensitive shrubs are brought inside and rest on shelving, vintage tables and credenzas alongside climbers, monstera and coleus as well as treasures picked up at flea markets. 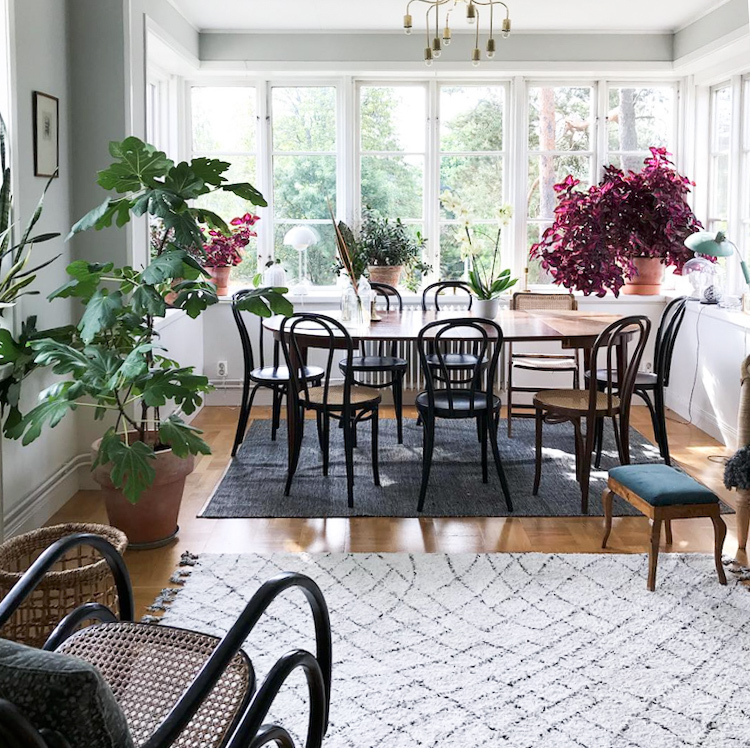 It’s hard not to fall in love with Malin’s charming home – which she shares with husband Markus and their children Ville (10) and Vidar (7). Välkommen in! My parents-in-law have had a climber like this around their window for decades – and I appreciate it every time I visit. 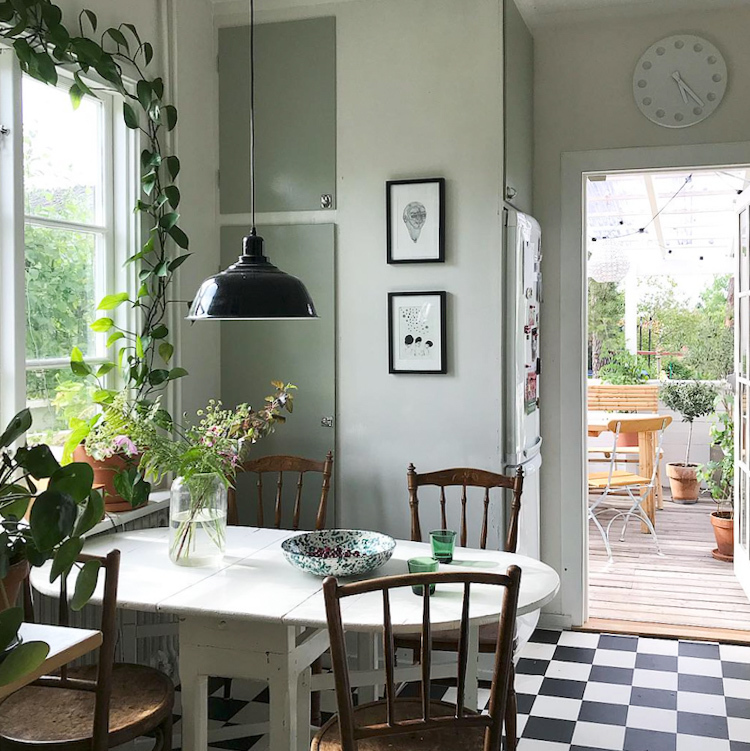 In Malin’s home, it makes a feature of the window – and adds a green feel even when there are no leaves on the trees outside. 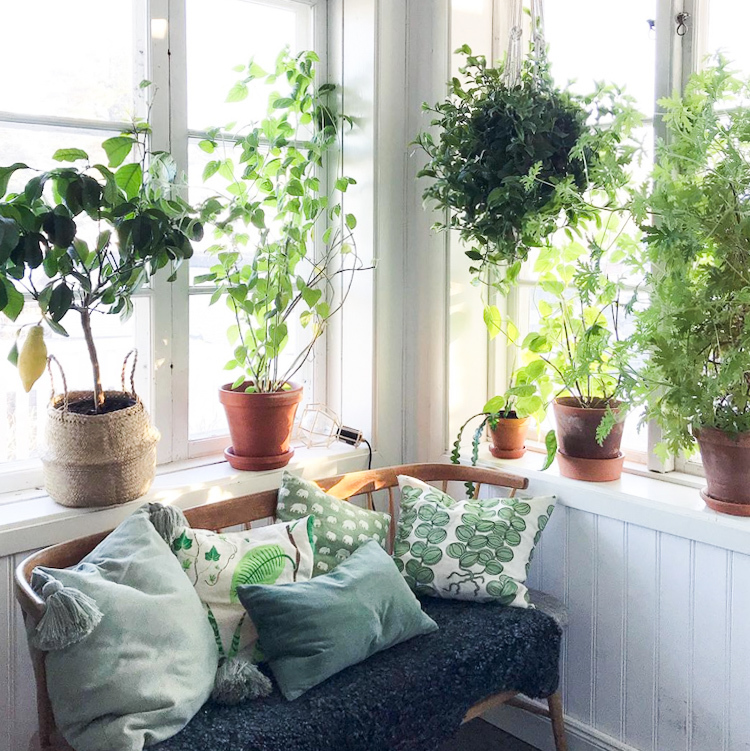 (See my guide to indoor climbing plants if you’re curious to do something similar!). 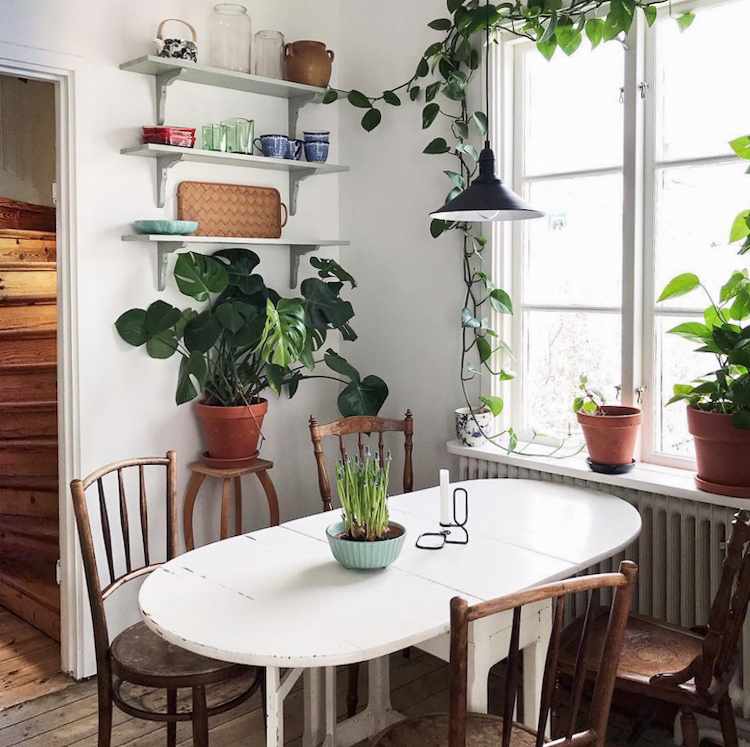 A classic danish Stoff candleholder* can be glimpsed amid the urban jungle atop a mid-century side table*. 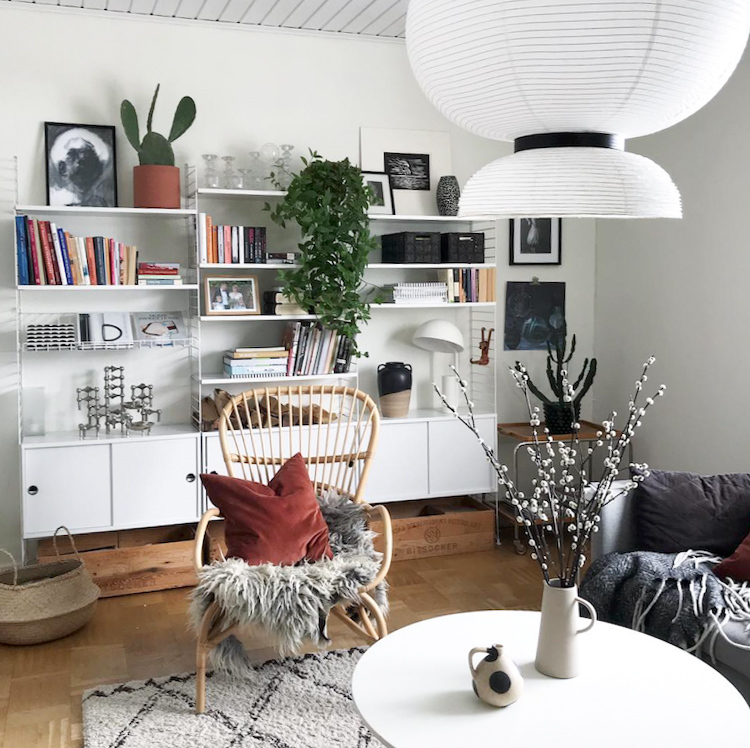 I remember seeing the same candleholder in Karolina Modig’s Stockholm home (another plant enthusiast!). I cheated a little here and am sharing a photo which Malin took at another time (which explains why it’s not the same arrangement seen in the photo above it!). I couldn’t resist though, as I love the lions head and gallery wall and thought you might too! Kim Kardashian is not the only who can break the internet. 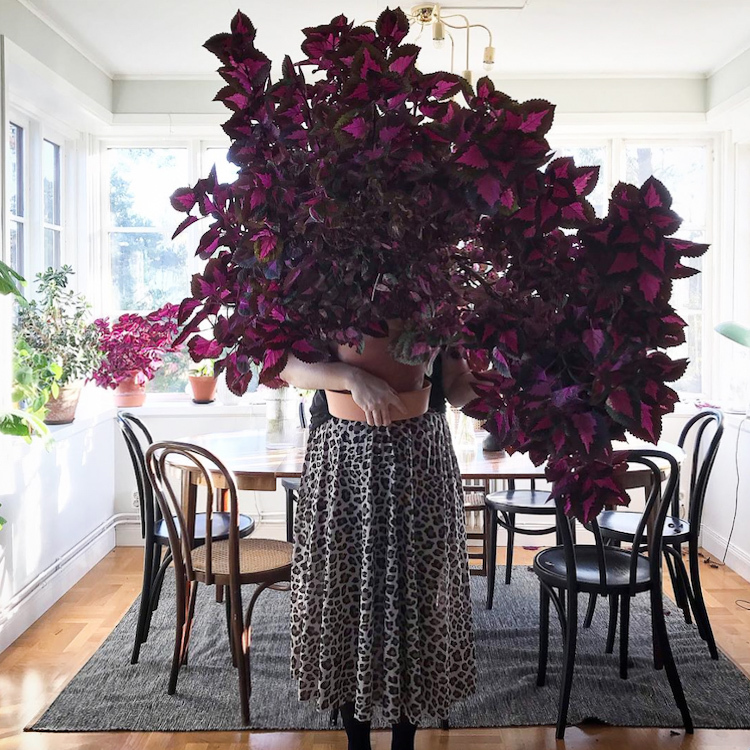 The incredible coleus seen in the corner of the family dining area (and in Malin’s arms below!) caused a stir on instagram in 2018! I can totally see why, how about you?! 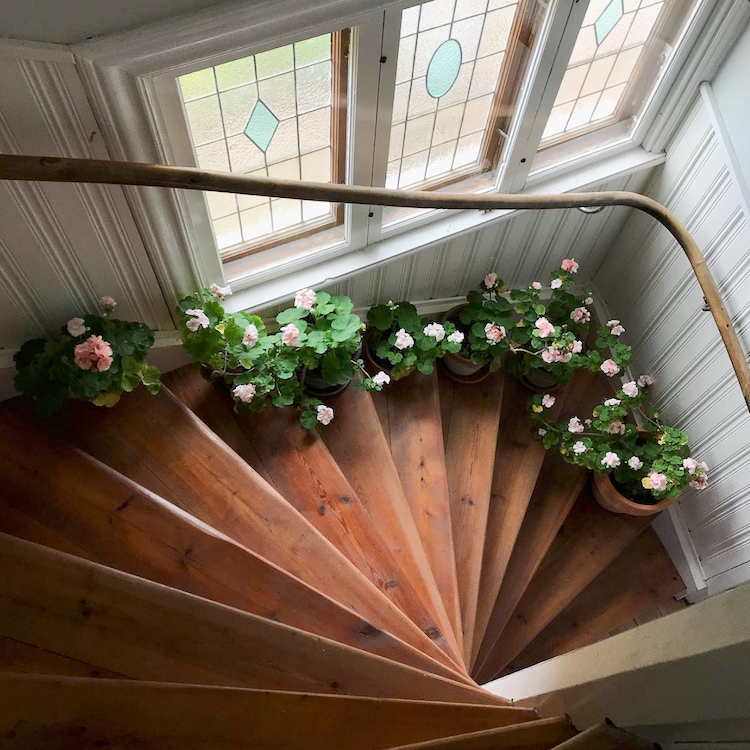 In the winter, there’s one geranium for every step! 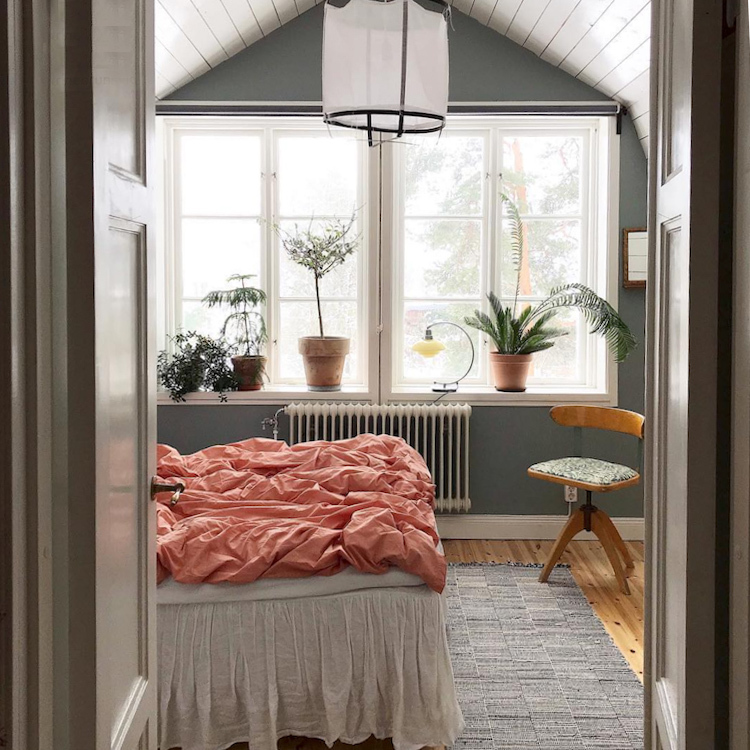 There’s so much to love about Malin’s bedroom – the A-frame ceilings, the vintage chair, the plants, the soft teal wall colour (by Jotun), the apricot linen duvet cover*. Isn’t it pretty?! 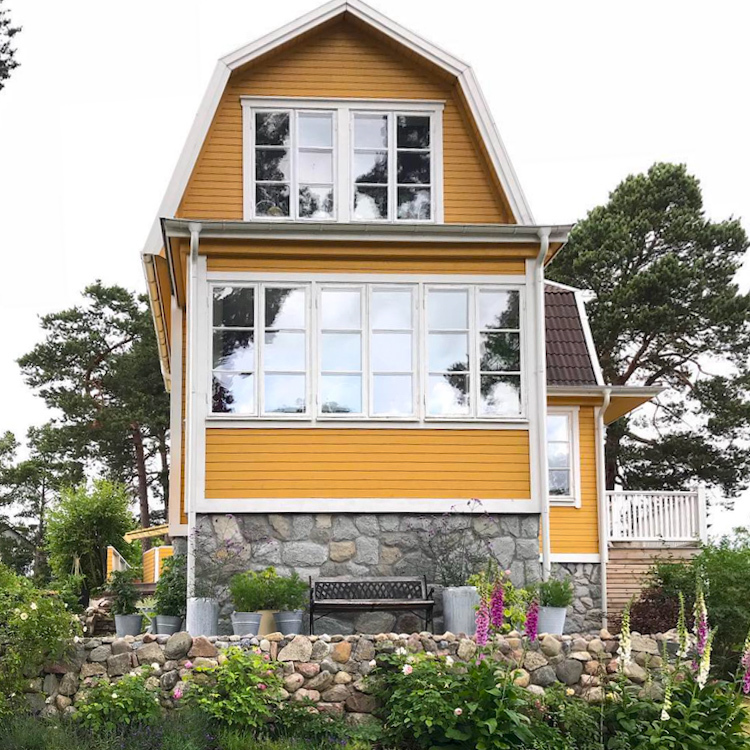 Looking at the exterior of Malin’s Swedish home – it’s hard not to dream about moving to the suburbs of Stockholm, does anyone else feel the same?! 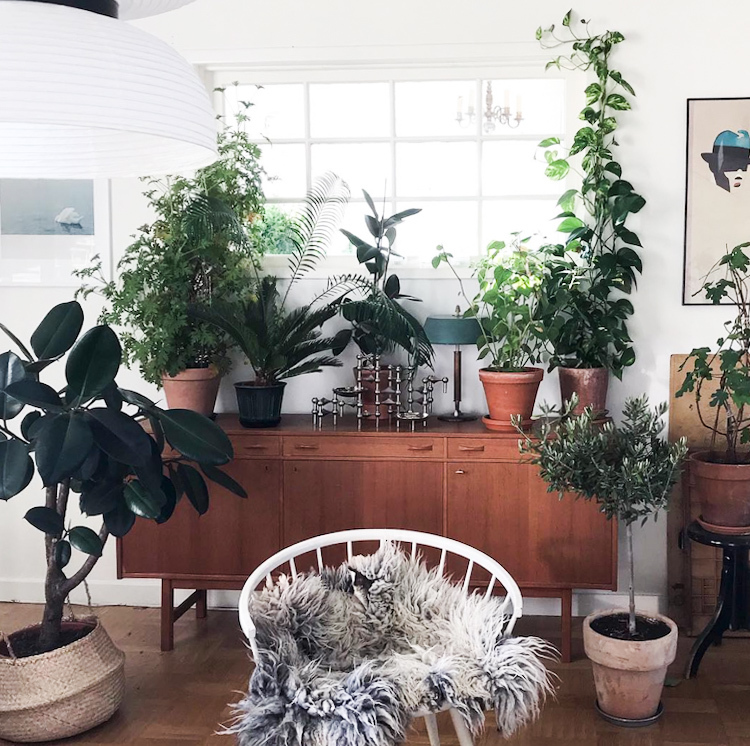 Failing that, this home has taught me that there’s absolutely nothing stopping me from bringing more plants into my homes. 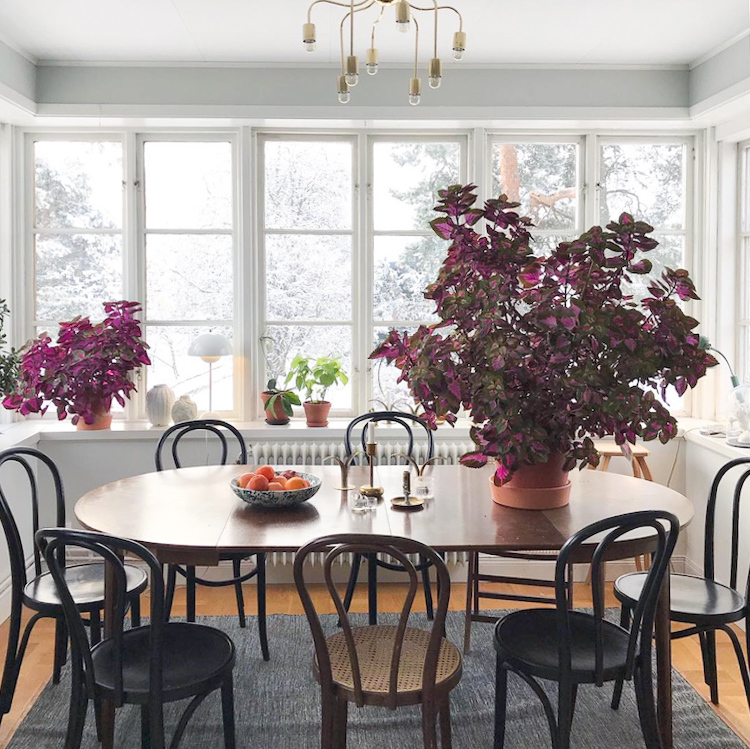 I love how a coleus like Malin’s adds a burst of colour to the room too – perfect! 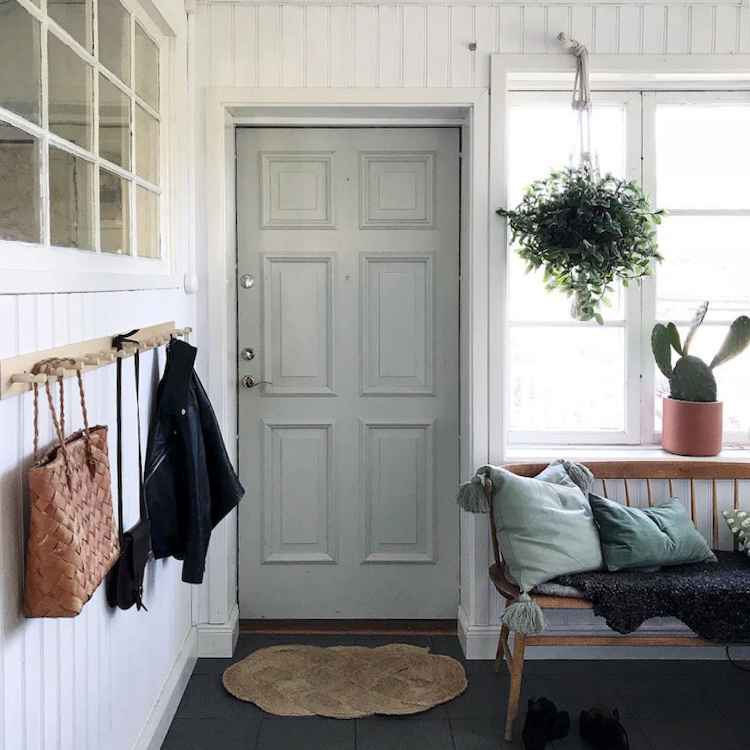 See more snaps of Malin’s lovely home over on her instagram @malinbrostad – and other Swedish homes with pretty outdoor spaces here, here and here! I’ve just returned from a great weekend in Frankfurt where I attended Ambiente Fair. It was a bit of a flyby tour and I’m feeling sooooo tired this morning (cue – ‘kids, can you fix your own breakfast today’?!) but it was super inspiring too! If you’d like to take a peek at the latest trends, I recorded this interview with the Ambiente Facebook Live (eeek!) team on Saturday.